Back to School: Happy New Year! - KB Concepts P.R. You are here: Home / Branding / Back to School: Happy New Year! Despite my three daughters all being out of college and pursuing careers now, Labor Day weekend still summons the excitement of those many back to school seasons. The start of each new year, and often a new school as they went through elementary, middle, high school and college, all lent September a sense of fresh starts, new beginnings and a world of possibilities. 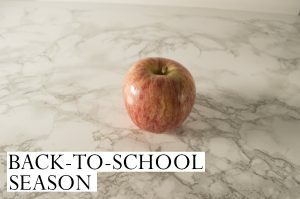 Along with the bittersweet, slightly melancholy air the end of summer brings, this back to school week always feels like the true start of a new year for me and my business. After the slower pace of summer, when clients and I take vacations and otherwise cut back on the usual hectic pace of work — along with fewer events, conferences and evening meetings — work revs up again this month with new clients, renewed enthusiasm for planned projects, and yes, even wearing sweaters, socks and long pants again. KB Concepts was thrilled to recently begin working with new client B.M. Smith & Associates, a family-run real estate management, brokerage and development company serving South Arlington and Northern Virginia since 1908. Currently providing a series of branding, messaging and social media tutorials to senior staff and property managers, I am so impressed with this company’s history, vision and commitment to the community and its many nonprofit partners. Benjamin Mathew Smith, the entrepreneurial son of Canadian immigrant (and entrepreneur) Henry W. Smith, began serving Arlington 14 years before the County was even founded in 1932. He was an early member and chair of the Arlington County Board, and served on the Arlington Hospital and County School boards — all while building an office building, apartments and the family’s own homes along Columbia Pike, Arlington’s “first and newest Main Street.” Recently, the B.M. 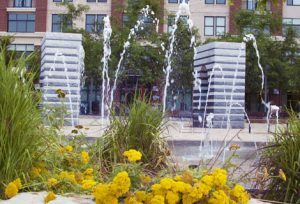 Smith family and partners dedicated land to establish Penrose Park and provided easement for the establishment of Pike Park where the Columbia Pike Farmers Market operates. With our tagline, Great Ideas for Good Causes, KB Concepts feels truly aligned in vision and spirit with B.M. Smith and our other wonderful clients — including the National Council on Problem Gambling, Aspire After School Learning, Arlington Community Federal Credit Union, BbG Fitness and Joe’s Place Pizza & Pasta — who all, whether nonprofit or for profit, approach their work and devote a portion of their efforts to improving our communities and the world we live in. I’m also excited that Awesome Women Entrepreneurs, the networking group for Arlington business owners (and new radio talk show on Arlington’s public WERA 96.7 FM), will be expanding to include a couple of new chapters this fall — as well as organizing our first getaway adventure to the Bar W Ranch in Northwest Montana for women entrepreneurs. As we head back to school or simply into the busy fall season, let’s all pull out our new notebooks, sharpen our pencils and re-dedicate ourselves to serving the greater good as well as our thriving businesses. Happy new year!